Articles Sea Safety message February 2013. Sea Safety message February 2013. Lifejackets save lives – all the evidence indicates that a correctly fitted lifejacket will significantly improve your chances of survival if the unforeseen or unfortunate occurs. Not only will a lifejacket keep you afloat and allow you to adopt the HELP position that minimises heat loss (Heat Escape Lessening Position), it should turn an unconscious casualty to keep the airway above the water, writes Peter Williams. 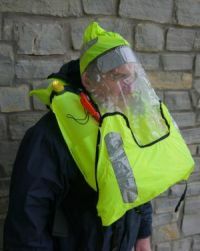 Lifejacket design has progressed and modern lifejackets are compact, lightweight and easy to wear. The correct fitting of the lifejacket is vital so that it functions correctly for the wearer – this is an extremely important aspect of the design of the lifejacket. Around 30% of lifejackets checked each year by RNLI Sea Safety Advisers would fail to operate correctly when deployed – this is a very scary statistic which can be reduced with a few simple checks. The webbing should be free from broken stitching and buckles and fasteners should operate freely and correctly. The inflation chamber should be in good condition and not abraded or punctured, the cylinder should be free of corrosion which could cause chaffing or puncturing of the inflation chamber. The inflation mechanism should operate correctly with the inflation cylinder screwed in securely (do not over-tighten), the weight of the fully charged cylinder is marked on the outside and can be checked by weighing on postal scales. Auto inflation cartridges should be in date and not “fired” and the jacket should be inflated using a dinghy or hand pump and remain inflated for 24 hours. Despite what your Mum said about the water holding you up it’s not true, as the average adult needs around 5kg of buoyant assistance or 50N to stay afloat without movement of the arms and legs. The water around our coasts is cold ranging between 9-14 degrees (if we are lucky) over the course of a year. If you find yourself in the water the most important thing is to keep warm by adopting the HELP position – Heat Escape Lessening Position by keeping your arms close to your body to protect the armpits and hands folded across the groin to prevent heat loss from these key areas. The legs should be slightly bent and brought up towards the body. 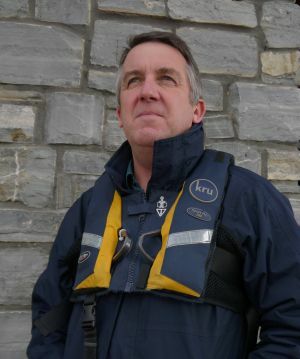 Peter will be running a free lifejacket clinic and offering free sea safety advice at the boat jumble sale at the boathouse on Sunday 14 April between 9am and noon.